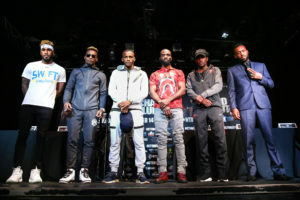 The following is the Boxing Insider notebook for the week of March 19th to March 26th; covering the comings and goings in the sport of boxing that you might have missed. “The fight took place in my country (formerly known as Zaire), since seeing seeing that fight, it really motivated me to be the face of boxing in my country, and then the whole world,” said Mukala. The following is the Boxing Insider notebook for the week of November 7th to November 14th; covering the comings and goings in the sport of boxing that you might have missed. Two of Boxing’s Biggest Stars make their highly anticipated return at the iconic Stubhub Center in Carson, CA. on Saturday, December 8 for an outstanding double-header featuring Undisputed Women’s Welterweight World Champion ‘The First Lady’ Cecilia Braekhus (34-0, 9 KOs) and Four-Division Pound for Pound World Champion Roman ‘Chocolatito’ Gonzalez, (47-2, 39 KOs). The event will be televised live on HBO Boxing After Dark beginning at 10:20 p.m. ET/PT. Former Men’s #1 Ranked Pound-for-Pound Fighter in the World, Gonzalez of Managua, Nicaragua, clashes with former world champion Pedro ‘Jibran’ Guevara, (32-3-1, 19 KOs) of Sinaloa, Mexico in a ten-round super-flyweight bout. A press conference was held on Wednesday in Downtown Los Angeles to formally announce the event. Also appearing at the press conference was popular atomweight world title challenger Louisa ‘Bang Bang Lulu’ Hawton, (8-2-0, 4 KOs), of Perth, Australia, who will also be fighting on the non-televised portion of the show. ‘I’m defending all the belts as you see in front of me. They represent a life-time of hard work. Hopefully when it becomes time to retire I can do so undefeated, that is my dream, that is my goal. I thank you for all your support and to the fans here in the United States and those attending the fight Internationally. Magdziak-Lopes is unbeaten in her last 3 fight, including victories over Paty Ramirez and Lisa Noel Garland. Returning to battle less than three months after a knockout victory, Roman ‘Chocolatito’ Gonzalez looks to continue on his path towards a fifth world title. On September 15, 2018, the hard-hitting Nicaraguan dismantled Moises Fuentes with a ‘Knockout of the Year’ stoppage in the fifth round on the HBO Pay-Per-View® Undercard of the World Middleweight Championship between Gennady Golovkin and Canelo Alvarez. Gonzalez has held world titles in four weight divisions; minimum weight, junior flyweight, flyweight and super flyweight. From September 12, 2015 to March 18, 2017, he was the Consensus #1 Pound-for-Pound Fighter in the World. The 29-year-old Guevara first became a world champion on December 30, 2014 with a seventh-round knockout of Akira Yaegashi in Tokyo, Japan, winning the vacant WBC Junior Flyweight World Title. After making two successful defenses in Mexico, Guevara would return to Japan losing a split-decision to Yu Kimura on November 28, 2015. In 2018, Guevara has recorded two stoppage victories, an eighth-round knockout of Angel Guevara on May 18, 2018 followed by a tenth-round stoppage of Roberto Sanchez on September 1, 2018. 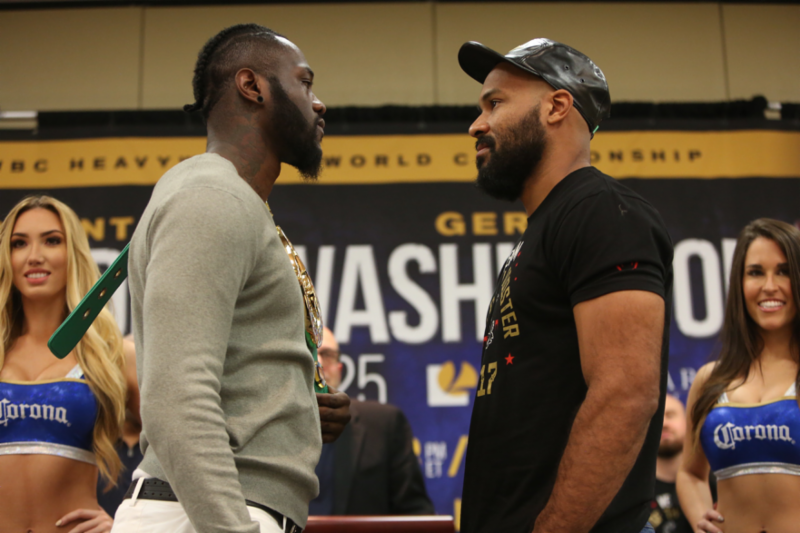 A split-site doubleheader airing live on SHOWTIME and streaming live on SHOWTIME Sports social media platforms will kick off a big night of boxing on Saturday, December 1, leading into the SHOWTIME PPV presentation of the Deontay Wilder vs. Tyson Fury heavyweight blockbuster event presented by Premier Boxing Champions. Chavez, Jr. (50-3-1, 32 KOs) is the son of Mexican boxing legend and Hall of Famer Julio Cesar Chavez, Sr. The 32-year-old from Culiacan, Sinaloa, Mexico ripped off 46 straight victories to start his career using a gritty boxing style that denoted his toughness in the ring. Chavez is seeking to rebound from a unanimous decision loss to middleweight champion Saul “Canelo” Alvarez on May 6, 2017. SHOWTIME Sports delivers a day in the life of training camp with Philadelphia’s Jaron Ennis as he prepares to face Raymond Serrano in the main event of ShoBox: The New Generation this Friday, November 16, live on SHOWTIME at 9:35 p.m. ET/PT from 2300 Arena in Philadelphia. Ennis (21-0, 19 KOs), who knocked out Armando Alvarez in a third-round stoppage during his ShoBox debut in July, has knocked out 11 consecutive opponents. He faces perhaps the toughest test of his career in Serrano, a 29-fight veteran whose five losses have come against opponents with a combined fight night record of 89-1-1. Training under his father Bozy, who also trained Jaron’s older brothers Derek Jr. and Farah, the 21-year-old undefeated prospect puts in work in what he describes as an ‘old-school’ training camp consisting of chopping wood, flipping tires and climbing rope. With victory in his hometown on his mind this Friday, Ennis vows to become a household name in the sport of boxing. “When you’re a boxer from Philly, it means you have to put on a show,” says Ennis. “I love fighting at home, that’s the best feeling ever. People let the crowd get to them, I just feel at home. I feel comfortable and relaxed. I get to show out on SHOWTIME in Philly, get a win and look good doing it. In the co-feature of Friday’s live ShoBox telecast, series veterans Kenneth Sims Jr. (13-1-1, 4 KOs) and Samuel Teah (14-2-1, 7 KOs) meet in an eight-round super lightweight bout. Undefeated Ukrainian Arnold Khegai opens the three-fight card when he takes on New Jersey’s Jorge Diaz (19-5-1, 10 KOs) in an eight-round super bantamweight bout. Papot, 27, who is also currently rated #7 Middleweight in the World (WBA) began boxing at the age of 5 in his hometown of Saint Nazaire, France, where he still currently resides. With an impressive amateur pedigree, Papot has fought over 100 amateur bouts, earning the titles of two-time junior French champion, two-time vice champion and senior champion of France. Papot fought a total of thirty bouts with the French national team, reaching the quarter-finals of the European Championship. In March of 2017, Papot took on undefeated Belarus southpaw, DZIMITRY ATROKHAU (then 15-0 5KO’S), where he earned the WBA Continental Middleweight Title by a dominating unanimous decision victory, with scores of 116-112 and 115-113 (2X). In his next bout, Papot took on co-Frenchman BARTHELEMY LEFEBVRE (then 16-8-1 4KO’s), for the France Super Welterweight Title. Papot dismantled Lefebvre over the 10-round bout, winning another unanimous decision with scores of 99-91 and 98-92 (2X). Papot has successfully defended his title two times since being crowned Champion. Star Boxing anticipates announcing David Papot’s next bout in the near future. Top light heavyweight contender Sullivan Barrera bounced back into the win column with a dominant decision victory earlier this month in New York. 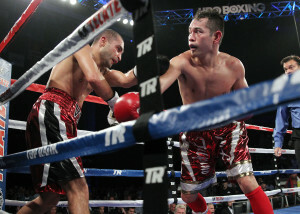 Barrera started off strong and won by the scores of 99-91 and 98-92 twice. Along with the victory, Barrera also became a promotional free agent and is looking to get the biggest possible fights. “I saw on social media that Badou Jack is looking for an opponent in January and that time table works perfect for me. 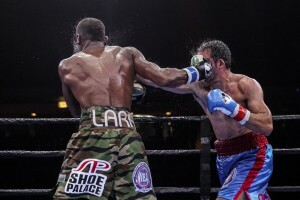 I am sure the fans would like to see me and Jack trade punches,” Barrera stated. 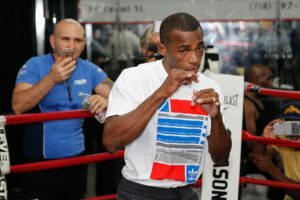 The Cuban slugger holds victories over Joe Smith Jr, Vyacheslava Shabranskyy, and Felix Valera and has also been in the ring with champions like Andre Ward and Dmitry Bivol. Barrera is driven to accomplish his goal of becoming a world champion and will not stop until he fulfills his destiny. “At this point in my career I only want to fight the best. I have always wanted to be a champion and I will accomplish my dream. I want to fight the Adonis Stevenson-Olesandr Gvozdyk winner, the Eleider Alvarez-Sergey Kovalev winner, Jack, Artur Beterbiev. Those are the guys I want. There are no excuses for these fights not to happen. I don’t have a promoter so any of these fights should be easy to make,” said Barrera. Yuriorkis Gamboa and Juan Manuel Lopez were both victorious this weekend and have set up a possible fight in the very near future. “I don’t know how he absorbed all the punishment. I couldn’t know him out but it was a good fight. 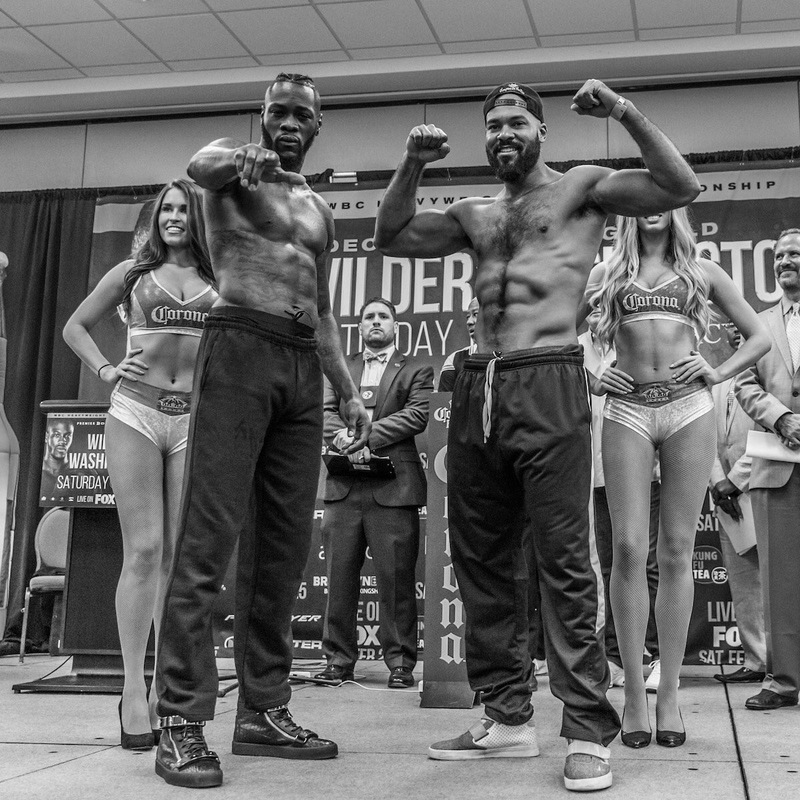 The most significant heavyweight event in the U.S. in more than 15 years will feature an undercard lineup of stellar fighters including the return of a unified world champion and two of boxing’s hardest-hitting heavyweights. Undefeated, unified 154-pound world champion Jarrett Hurd along with heavyweight title contender Luis Ortiz and top heavyweight prospect Joe Joyce will fight in separate bouts on the SHOWTIME PPV® undercard of the Deontay Wilder vs. Luis Ortiz heavyweight blockbuster event presented by Premier Boxing Champions on Saturday, December 1 at STAPLES Center in Los Angeles. 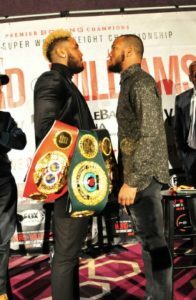 Hurd (22-0, 15 KOs) returns for his first fight since unifying the super welterweight division earlier this year to defend his IBF and WBA titles against British Commonwealth champ Jason Welborn (24-6, 7 KOs). 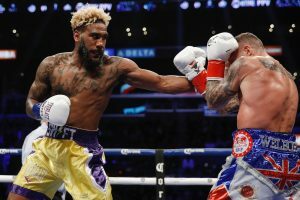 Hurd, who edged Erislandy Lara in a leading candidate for 2018 Fight of the Year in April on SHOWTIME, will enter the ring for the first time since undergoing rotator cuff surgery as he targets another title unification in 2019. 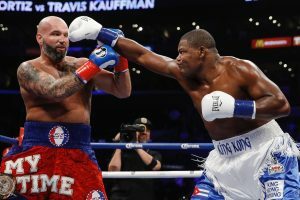 Cuban heavyweight slugger Luis Ortiz (29-1, 25 KOs) will continue his quest for a second shot at a heavyweight world championship as he takes on American Travis Kauffman (32-2, 23 KOs) in a 10-round bout. Ortiz went toe-to-toe with Wilder in another contender for Fight of the Year in March on SHOWTIME and returns for his third bout of 2018 with his sights set on a rematch with Wilder. 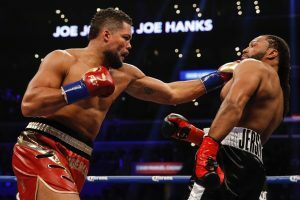 In the opening bout of the SHOWTIME PPV, 2016 Olympic Silver Medalist and unbeaten heavyweight Joe Joyce (6-0, 6 KOs) will face his sixth opponent of 2018 when he meets Joe Hanks (23-2, 15 KOs) in a 10-round heavyweight bout. 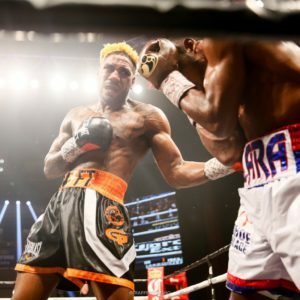 Hurd, who hails from Accokeek, Md., floored Erislandy Lara in the final minute of their unification showdown to earn the narrow split-decision victory over the divisions’ longest-reigning champion. Following the bout, Hurd underwent surgery and subsequent rehab to repair a rotator cuff. Hurd won the IBF title with a TKO of Tony Harrison in 2017 and handed Austin Trout his first loss via knockout later that year. The 28-year-old is known for his all-action, fan-pleasing style that had seen him record seven straight stoppages prior to his decision win over Lara. Jason Welborn, from West Midlands, England, will make his U.S. debut on the heels of two wins over previously once-beaten Tommy Langford for the British middleweight title in 2018. Langford now moves back to the 154-pound class, where he has faced Matthew Macklin and Liam Smith in all-British encounters. The 39-year-old Ortiz returns to STAPLES Center for his second consecutive fight in Los Angeles after scoring a second-round knockout of Razvan Cojanu in July. In a March, Ortiz nearly had Wilder out on his feet in the seventh until he ultimately succumbed to Wilder’s power in the 10th round, suffering the first loss of his professional career. A consensus top-5 heavyweight, Ortiz will look for another knockout as he hopes to earn a rematch with Wilder in the revived heavyweight division. The 6-foot-6 Joyce, of London, England, has started his professional career with a 100 percent KO rate after turning professional in 2017 at the age of 32. An accomplished amateur, Joyce claimed the super heavyweight silver medal for Great Britain at the 2016 Olympic Games. Joyce, who trains in Big Bear, Calif. under renowned trainer Abel Sanchez, made his U.S. debut in September with a fifth-round knockout of Iago Kiladze. Hanks, of Newark, N.J., started his career with a 21-0 run before suffering consecutive losses to Andy Ruiz Jr. in 2013 and Derric Rossy in 2014. After a three-and-a-half-year layoff following the loss to Rossy, Hanks, who lives in downtown Los Angeles, has recovered his form and returned to score a unanimous decision over Joel Caudle and a first round knockout of Terrence Marbra in consecutive fights. The following is the Boxing Insider notebook for the week of August 28th to September 5th, covering the comings and goings in the sport of boxing that you might have missed. Exciting former world champion Nonito Donaire (37-4-0, 24 KOs) will return to the ring to take on Ruben Garcia Hernandez (22-2-1, 9 KOs) for the WBC Silver Featherweight Title in a bout that takes place alongside the World Boxing Super Series Quarterfinals on Saturday, September 23 from the Alamodome live in San Antonio and presented by Ringstar Sports. Additional action will feature a 10-round showdown between once-beaten cruiserweights Keith Tapia (17-1, 11 KOs) and Lateef Kayode (21-1, 16 KOs) that will serve as the reserve match for the World Boxing Super Series Quarterfinal matchup of Cuban WBA World Champion Yunier ‘The KO Doctor’ Dorticos (21-0, 20 KOs) versus Russian Dmitry ‘Russian Hammer’ Kudryashov (21-1, 21 KOs). Donaire returns to the ring after a controversial loss last November to Jessie Magdaleno. Donaire recently teamed up with Ringstar Sports where he plans to reclaim his supremacy in the featherweight division. Garcia Hernandez is a tested Mexican fighter looking to make a name for himself in the U.S. at the Alamodome. Tickets for the live event are priced at $250, $125, $100, $50, and $30, and are on sale now. Tickets are available at ticketmaster.com HERE. The Filipino fighter known as the “Filipino Flash” Donaire grew up in Northern California and now fights out of Las Vegas. His last fight was November 2016 when he battled Magdeleno for a junior featherweight world title in a bout that he lost by controversial decision. Hoping for a rematch that was never made, he partnered with Ringstar Sports looking to return to the top of the featherweight division. Prior to that, Donaire won belts in four different weight classes and was recognized as the 2012 Fighter of the Year by the BWAA, ESPN and Ring Magazine. Fighting out of Mexico City, Mexico, Hernandez made his pro debut in 2010. Since that time he has battled his way through Mexico while fighting in the U.S. four times. Hernandez enters this bout on a seven fight winning streak and plans to make a name for himself in the United States on September 23rd when he takes on Donaire. The 27-year-old Tapia returns to the ring after dropping a decision to unbeaten Andrew Tabiti that snapped a 17-fight win streak to begin his professional career. Originally from Puerto Rico but fighting out of the Bronx, Tapia has picked up victories over durable veterans Garrett Wilson and Anthony Caputo Smith and will look to cement his status as a cruiserweight contender on September 23rd. A former title challenger at cruiserweight, Kayode last battled Denis Lebedev for his cruiserweight crown in a November 2015 bout in Russia. Fighting out of Hollywood, Calif., by way of Nigeria, Kayode has shared the ring with the likes of Antonio Tarver and Luis Ortiz while taking down Felix Cora Jr, Matt Godfrey and Nick Kisner on his way to an unbeaten mark after his first 21 pro fights. Hennessy Sports is delighted to announce a groundbreaking partnership with YouTube that will offer a new way of watching Boxing. The blockbuster WBO World Heavyweight Championship title fight between Joseph Parker and Hughie Fury on Saturday 23rd September at the Manchester Arena will be shown exclusively live in the UK and Ireland on YouTube (www.youtube.com/parkerfury) on a pay-per-view basis with further countries to be announced shortly. www.youtube.com/parkerfury is the home of Hennessy Sports YouTube Channel which is called The Boxing Channel presented by Hennessy Sports. This represents fantastic value for money to watch one of Britain and Ireland’s most exciting young talents challenging for the prestigious World Heavyweight title at half the price of regular Pay-Per-View events and viewers can watch live at a fan-friendly UK and Ireland prime-time. With 1.5 billion viewers globally, Hennessy Sports believes that partnering with YouTube (which is the world’s biggest provider of online video content) could prove to be a pivotal change in the sport’s landscape. Through the years boxing has been delivered to fans via the traditional route of TV and after receiving numerous offers from TV broadcasters for the event, promoter Mick Hennessy, CEO of Hennessy Sports, has made the bold and visionary move to partner with YouTube. Hennessy believes this will take Parker v Fury to a global audience; bring in younger viewers and attract a new generation of fans to the sport with the wide range of devices that the fight can be viewed on. On Friday, Sept. 15, one day before the highly anticipated battle for middleweight supremacy between Canelo Alvarez and Gennady “GGG” Golovkin, WBA Interim Featherweight Champion Claudio Marrero (22-1, 16 KOs) will make the first defense of his title against Jesus Rojas (25-1-2, 18 KOs) in the 12-round main event of Golden Boy Boxing on ESPN at the MGM Grand Marquee Ballroom in Las Vegas. The ESPN3 livestream of the undercard bouts begins at 7:30 p.m. ET/4:30 p.m. PT, followed by the main event at 9:00 p.m. ET/6:00 p.m. PT on ESPN Deportes and streaming live on ESPN3 and on ESPN2 at 1:15 a.m. ET/10:15 p.m. PT. Marrero, of Santo Domingo, Dominican Republic, captured the Interim WBA Featherweight Title with a devastating first-round knockout of Carlos Zambrano in April 2017. Though suffering his only defeat against Jesus Cuellar in 2013, Marrero has scored six victories since then, five of them by knockout. Rojas will return after an impressive eighth-round technical knockout victory against the previously undefeated Abraham “Chamaco” Lopez. The native of Caguas, Puerto Rico, has taken on the likes of former world champion Jorge “El Travieso” Arce and Jorge “El Pilón” Lara of Mexico (who will take on Joseph “JoJo” Diaz in the co-main event of Canelo-Golovkin). Rojas will look to take yet another step towards the top of the 126-pound division with a victory over Marrero. In the co-main event, Boston’s Rashidi “Speedy” Ellis (18-0, 12 KOs) will make the second defense of his IBF North American title against Juan Carlos “Merengue” Abreu (19-3-1, 18 KOs). Ellis earned his crown with an impressive first-round knockout victory over Eddie “E-Boy” Gomez in December 2016. In his first defense, Ellis fought in a toe-to-toe battle against John Karl Sosa en route to a majority decision victory in April 2017. 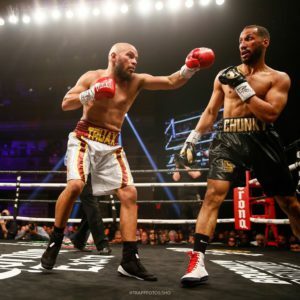 Ellis faces a tough challenge in Abreu, a veteran of the Dominican Republic with tough fights against Pablo Cesar “El Demoledor” Cano and Humberto “La Zorrita” Soto on his resume. Ryan “Kingry” Garcia (10-0, 9 KOs) will open up the ESPN Deportes transmission in an eight-round fight for the Junior NABF Super Featherweight title against Miguel Carrizoza (10-2, 2 KOs) of Nogales, Mexico. Garcia, a young prospect of Victorville, Calif., is coming off a spectacular first-round knockout of Mario Antonio Macia and will look to earn his seventh knockout victory in a row on Sept. 15. Horacio “Violento” Garcia (32-3-1, 22 KOs) of Guadalajara, Mexico will take on fellow countryman Diuhl Olguin (11-7-2, 9 KOs) in an eight-round super bantamweight rematch. In their first encounter, Garcia lost via an upset unanimous decision in July of this year. In the night’s swing bout, Alexis “Laberinto” Salazar (11-3, 3 KOs) of Tlaquepagque, Mexico will take on Evan Torres (6-4, 5 KOs) of El Paso, Texas in a scheduled six-round middleweight fight. The bout will be a rematch of their May 2017 fight, which Salazar won via close split decision. Opponents for former IBF champion Jose “El Tecuala” Argumendo (20-3-1, 11 KOs), who will participate in an eight-round minimumweight bout, and Philadelphia’s Damon “No Smilin'” Allen, Jr. (12-0-1, 5 KOs), who will return in an eight-round lightweight fight, will be announced shortly. Marrero vs. Rojas is a 10-round featherweight fight presented by Golden Boy Promotions in association with TGB Promotions. The event is sponsored by Tecate, BORN BOLD; Hennessy, Never Stop, Never Settle; and Interjet. The event will beheld at the MGM Grand Marquee Ballroom in Las Vegas on Friday, Sept. 15. Doors open at 3:00 p.m. PT, and the first fight begins at 3:30 p.m. PT. The ESPN3 livestream of the undercard bouts begins at 7:30 p.m. ET/4:30 p.m., followed by the main event at 9 p.m. ET/6 p.m. on ESPN Deportes and streaming live on ESPN3 and on ESPN2 at 1:15 a.m. ET / 10:15 p.m. PT. Before fight fans turned their attention to the desert with knockout PPV numbers last Saturday, the FIGHTNIGHT LIVE Facebook series landed a massive haymaker of its own. Linacre Media and CES Boxing partnered on a pre Mayweather-McGregor card that ran from 6-9:30 p.m. ET live from Foxwoods in Connecticut, with the tech-forward, fan-friendly Facebook broadcast platform drawing an audience of 201,935 fight fans, and counting. Over the first four months of programming, the numbers on the FIGHTNIGHT LIVE series have showed promise and potential for the new platform with an average of more than 85,000 fight fans tuning in per event. The August “Super Saturday” from Foxwoods (202,000), the July Roy Jones Jr. “Desert Showdown” from Phoenix (63,000), the May “Slugfest at the Sun” from Mohegan Sun (46,000) and the June “Rosemont Rumble” from Chicago (32,000) saw a total of more than 8,000 total hours of Facebook video consumed by 342,000-plus users across all devices. In addition to the raw viewership numbers, the fully-interactive, fan-friendly productions have seen more than 33,000 collective live post engagements, including more than 3,000 “likes” or “loves,” more than 10,000 comments and 3,000-plus shares. FIGHTNIGHT LIVE broadcasts are viewed by 76 percent men, 24 percent women. The top demographic is comprised of males aged 25-34, which encompasses approximately 30 percent of the audience, on average. The Aug. 26 Foxwoods “Super Saturday” show stands out individually with 201,935 views across 3,336 live hours of content, with 8,224 viewer interactions including 1,133 “likes” or “loves,” 1,570 comments and 1,392 shares. “For more than 25 years, CES has delivered boxing excitement to fans all over the world. The tradition continued Saturday night at Foxwoods when we teamed with FIGHTNIGHT LIVE by using cutting edge technology allowing fight fans to view the fights live on Facebook. This historic, record-setting event was the result of a great production team and action-packed, competitive fights,” said CES President Jimmy Burchfield, Sr.
Frank “Notorious” Galarza signed with Main Events promotions, it was announced yesterday. The Brooklyn native, 31, was on track as a super welterweight contender, posting an undefeated record (17-0-2, 11 KOs) until he ran into Jarrett “Swift” Hurd in November of 2015. Galarza was stopped in the sixth round by a brutal Hurd uppercut, a punch that has become something of a trademark for the Accokeek, Maryland fighter. In September of last year, Galarza’s career went sideways again as he dropped a ten round majority decision to crafty veteran Ishe Smith. Trying to start fast, Galarza walked into a trap in the second round and was unable to close the deficit, at least on two judges’ cards. The thirty-one year old boxer knows it is time to make the leap from contender to champion. 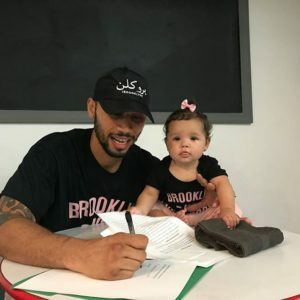 Away from the ring, Galarza is a new father, as well as a man who believes in giving back to his community. In 2014 he founded Youth Fighting Forward, helping young people reach their goals through boxing, education, and job training. 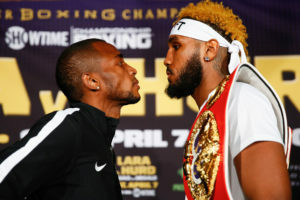 A serious person as well as serious contender, Galarza hopes to make his mark in an already loaded division, against the likes of Erislandy Lara, the Charlo Brothers, Jarrett Hurd, and Demetrius Andrade. For more information on Youth Fighting Forward, visit frankgalarza.com/youthfightingforward. There is a perception in boxing today that too many fighters, when they finally reach that goal of grabbing their first belt, spend too much time resting on their laurels, maybe trying to maximize their earning power by dusting a few weak challengers. And who can blame them, really? Success in boxing requires years of sacrifice and rigorous training, so once a fighter reaches the top, there is no hurry to risk that coveted position. 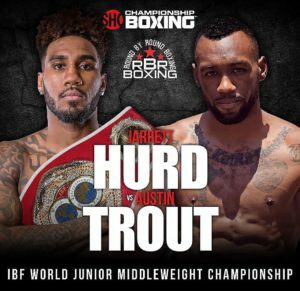 So big respect to Jarrett “Swift” Hurd (20-0, 14 KOs), who has set his first title defense against Austin Trout (30-3, 17 KOs). 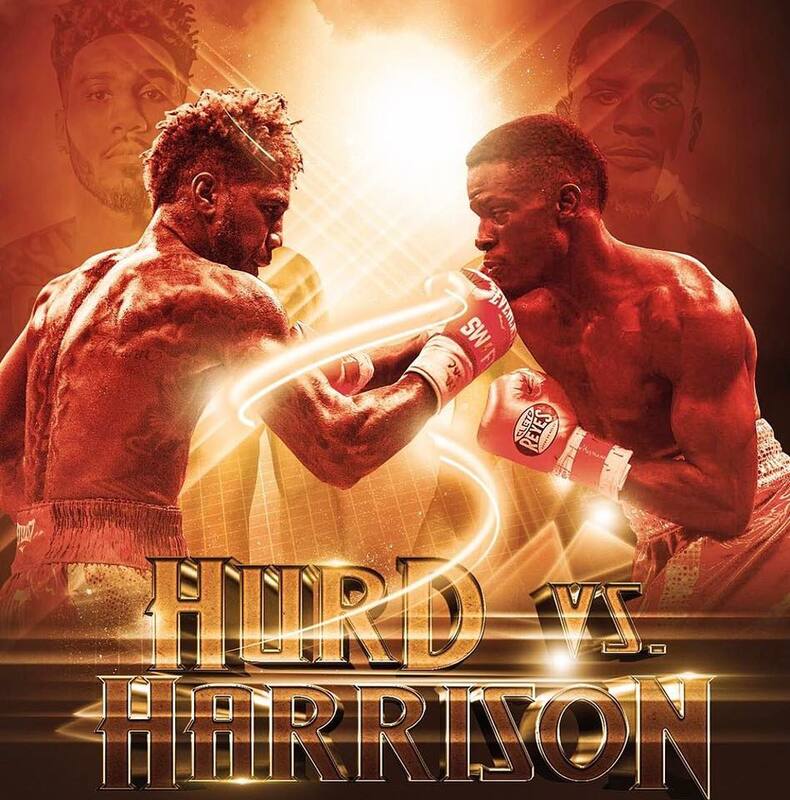 Hurd, who proudly hails from Accokeek, Maryland, won the IBF super welterweight belt last February in a tactical and very professional stoppage of well-regarded veteran Tony Harrison (24-2, 20 KOs). 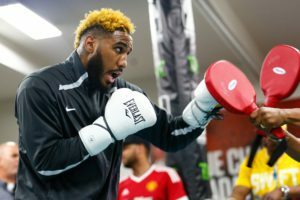 Although it was Hurd’s first title fight, he approached the bout methodically and patiently, doing some serious bodywork with his left hook and waiting for an opening. Hurd was also surprisingly versatile in this bout, working behind the jab from range but also comfortable and effective on the inside. Hurd is classically trained, so to speak, and takes pride in being able to display all aspects of the craft. Austin Trout, from Las Cruces, New Mexico, is a serious threat. He has a long professional resume — he fought Miguel Cotto, Erislandy Lara, and Canelo Alvarez back to back — and he brings a tricky, southpaw style into the ring. Trout has a full professional tool kit and enough experience to make adjustments during the fight. His last bout, against rising star Jermall Charlo, was a close unanimous decision loss (116-112, 115-113, 116-112). While making no excuses, Trout was bitterly disappointed with his loss to Charlo, and the Hurd fight might be his last chance to regain a top spot in the division. As I see it, Hurd still has some defensive issues that Trout may be able to exploit, while Trout is vulnerable to a short right counter when he fights on his front foot. This bout may hinge on ring IQ and ring adjustment — which fighter will be able to solve his opponent first? This will be an exciting card, also featuringMikey Garcia vs. Adrian Broner. Garcia, a multiple division champ, is moving up to 140 lbs. Having put his legal issues behind him, Garcia destroyed an overmatched Dejan Zlaticanin in a scary knockout in January, and he is looking to make up lost time. Technically proficient, Garcia sits down on his punches, generates real power, and has a mean streak when he steps between the ropes. No disrespect to Broner, who is a warrior in the ring whatever problems he may have away from boxing, but I think Garcia will clean out most of the division, setting up a potential super-fight showdown with Terence Crawford. Showtime is broadcasting the fight on July 29th and it looks like the card will land at Barkley’s Center in Brooklyn, a fantastic venue for boxing.